OmniFocus 2 is an app created by Omni Group. It costs $19.99 and is available on the iPhone, iPad and iPod touch. If you want to follow the art of GTD (Getting Things Done) without stress, then this app is a must have. It features beautiful design and functionality. 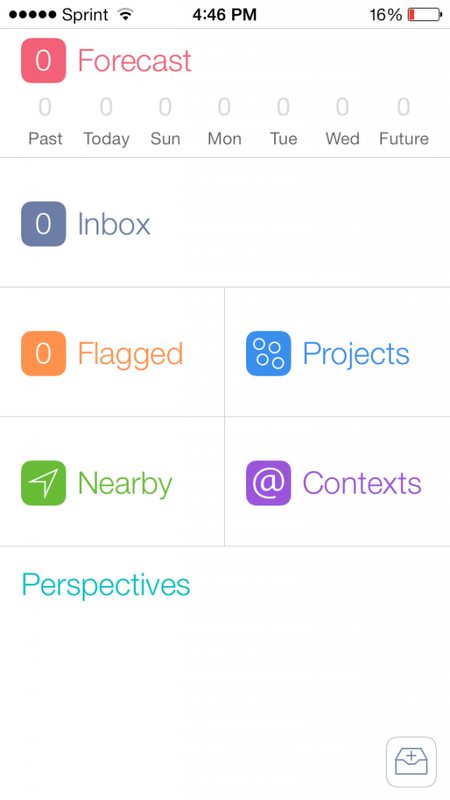 OmniFocus 2 isn’t just an app where you pile on lists with due dates. No, it’s much, much more than that. If you aren’t interested in taking your productivity planning to the next level, then this app is not worth $20. This app lets you create projects for your tasks. So let’s say you need to plan for your wedding. You would create a “Plan Wedding” project which may include tasks such as finding a dress, finding a DJ, ordering cake, etc. Projects also have different “project types”. These include sequential, parallel and single. Sequential means you have to complete task one before moving to task two. For example; if you’re building a website you have to complete task one: buying a domain, before completing task two: setting up the site and email. The parallel project type on the other hand lets you complete project tasks in any order you’d like. For example, if you’re planning for a wedding, it doesn’t matter if you book your DJ before you get a cake and vice versa. Single project types are used if there’s only a single task within your project. Projects can also be grouped into folders. If you have five projects for work, three projects for school, and two projects for your family (like planning trips), then you could put each into the folder they belong to. Omnifocus 2 doesn’t stop here though. It has another feature called “Contexts.” Each task can have its own context. A context means where each task should be completed. So let’s say you need to remind two teammates to do something when you get to work, you’d put these reminder tasks under the context of “Work.” Then when you get to work, this app will tell you what you need to do based on your location. Similarly if you need to do something at home, Starbucks, etc, you can assign tasks certain contexts. Well we’re not done yet… Here’s where the real usefulness of Omnifocus 2 pulls in. This app has a section called “Forecast.” Forecast shows you a week overview of tasks that are due, as well as events that will happen each day. So instead of just using normal task-list apps that have hundreds of tasks with due dates, you can use Omnifocus 2 to see exactly what needs to be done that week and beyond. You can also change the status of projects to Active, On Hold, Completed, and Dropped. Not to mention that tasks can even hold voice memos and photos. Omnifocus 2 has a beautiful interface and functionality that is well beyond its time. Other than the expensive price of this app, nothing is bad about it. It has no glitches or shortcomings. The only downside is that there is no PC version of the Omnifocus program. You can sync tasks and projects between the Mac app, and the iOS app, but if you have a PC you’re out of luck. If this app already sounds like it’s going to make you more productive, and you aren’t turned off by the $20 price, then it’s worth it. If you think $20 is too much to improve your productivity, then you probably don’t need this app, and you’d be better off with a free alternative such as Wunderlist.